Was Dice-K Worth The Money? With Daisuke Matsuzaka having just undergone Tommy John Surgery, he may have pitched for the final time in a Boston Red Sox uniform. The Red Sox paid about $100 million ($51 million posting fee for the rights to sign him and a 6-year, $52 million contract) to get Matsuzaka to pitch at Fenway Park. His time with the Red Sox has included a World Series championship, one incredible season in which he finished fourth in AL Cy Young voting and three so-so, injury-filled seasons. The question is, after so many high peaks and deep valleys, was Daisuke Matsuzaka worth the money Boston paid for him? The beginning of the Dice-K Era started off with a lot of promise. Matsuzaka was not a dominant pitcher by any means in 2007. But while adjusting to a brand-new life in America, in a new league with brand-new rules, new teammates and a very limited English linguistic ability, Matsuzaka’s first year was very solid. He finished with 15 wins, eating up 204.2 innings in the process. In the postseason, Matsuzaka won two games en route to the Red Sox’ second World Series championship in four seasons. The signs were there for him to be even better down the road. He had over 200 strikeouts and would be entering the prime of his career. It was a promising start with the very real potential for him to take big steps forward in 2008, when Matsuzaka would be fully accustomed to his new life. Sure enough, Matsuzaka took giant leaps forward in his second year in the majors, finishing 18-3 with a 2.90 ERA, leading the league with just 6.9 hits allowed per nine innings. At 27 years old, many thought this was exactly the pitcher the Red Sox would be getting when they paid all that money for him. At this point in time, following a World Series championship and a dominant season, Matsuzaka seemed like a bargain. Despite his successful 2008 campaign, there were some very big warning signs that Matsuzaka had been able to cover up by wiggling through tough jams. For one, his walk rate rose significantly, from 3.5 BB/9 during his rookie season to 5.0 BB/9 in his second year. In fact, Matsuzaka led the majors in walks issued that year, with 94. This lack of control made his pitch count rise rapidly and did not let him work deep into most games. Matsuzaka averaged just 5.78 innings per start, throwing only 167.2 innings in total. He was able to strand runners and escape a lot of damage because opponents posted just a .258 batting average on balls in play. Perhaps the biggest foreshadowing of the future was when Matsuzaka was placed on the 15-day disabled list with a shoulder injury at the end of May. 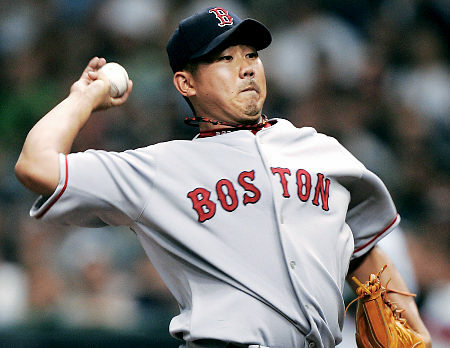 Though he was still able to make 29 starts that year, Matsuzaka may never have been able to rebuild his shoulder strength to what it was before the injury due to clashes with Boston management on rehab strategy, perhaps causing future injuries throughout the remainder of his time in Boston. Matsuzaka never made more than 25 starts in a season during the final three years of the Dice-K Era. Those warning signs in 2008 turned into major problems when he actually was healthy enough to pitch. His walk rate actually improved slightly to 4.6 BB/9 in 2009. Despite this, Matsuzaka was not nearly as fortunate as he had been in the previous year. He would finish 4-6 with a 5.76 ERA in a campaign limited to just 12 starts because of another shoulder injury. Opponents posted a .380 BABIP, swelling Matsuzaka’s hit rate to a staggering 12.3 H/9. Matsuzaka allowed 81 hits in just 59.1 innings, which along with his control problems, gave him a 1.87 WHIP. That number would have been worst in baseball had Matsuzaka thrown enough innings to qualify. 2010 was somewhat of a bounce-back year for Matsuzaka. A combination of back, neck and forearm injuries limited him to only 25 starts. His numbers were similar to that of his first season with Boston. He would go 9-6 with a 4.69 ERA in 153.2 innings, continuing to improve his walk rate per nine to 4.3 and reducing his WHIP to 1.37. However, when the Red Sox paid over $100 million for him to pitch, they expected a pitcher who would improve on a first season that featured so many adjustments. Matsuzaka had done the opposite following 2008, regressing to the same pitcher he was while facing so many changes in 2007. The regression continued into this season. Matsuzaka became even more of a nibbler than he had been before, walking 5.5 hitters per nine innings in 8 games, seven of them starts. Before tearing an elbow ligament in a May 16 start against Baltimore, he went 3-3 with a 5.30 ERA and 1.47 WHIP while actually being lucky with opponents posting a .248 BABIP. He would have just two quality starts all year, making it into the sixth inning in just three times. Matsuzaka underwent Tommy John surgery on Friday in Los Angeles. Recovery time normally takes between nine and 12 months, but it could take some pitchers over 15 months to fully recover and be able to pitch again. There is a chance that Daisuke Matsuzaka has thrown his final pitch as a member of the Boston Red Sox. Daisuke Matsuzaka’s major league career in Boston started off with so much promise. He had a solid rookie campaign while contributing to a World Series title. Had the Red Sox still been searching for a way to break the Curse of the Bambino and not won the World Series in 2004, the 2007 title would have immediately made Matsuzaka worth $103 million. But this was different. Red Sox fans certainly appreciated the title, but it was not as sweet as the 2004 championship. Matsuzaka had a great 2008 year, but was never the same pitcher after that, regressing to no more than a 5th starter at best when healthy in 2009, 2010 and 2011. Despite a strong start to his time in a Red Sox uniform, injuries and inconsistency throughout his tenure will leave Daisuke Matsuzaka to be remembered as a disappointment and not worth the large sum of money the Red Sox signed him for.